When writing a retirement card message you may often find it lacking something. They have a tendency to be quite boring and cliche, offering very little in the way of a touching thought or uplifting message. Retirement is a major event in a person’s life so it seems fitting that when celebrating it the least the words in a card can do are reflect how momentous it is. 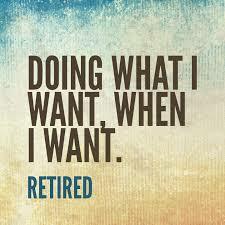 One of the best ways to do this is by using one or more retirement quotes. You can use lots of different types for your card, including religious, inspirational and funny retirement quotes. Using retirement quotes gives you the chance to be a little different in your wishes and also use someone elses words that may express what you are feeling far better than you could have done so on your own. As long as you pick your quote, or quotes, well then you will make your card come alive and avoid being just another dull, forgettable greeting card. “You know that retirement is coming. It isn’t as though it just shows up one day and takes you by surprise, so you need to get ready for it.” Batya Shevich, Warren Buffett: To Be Rich And Successful Is Easy! “Establishing new schedules and routines is a great way to make the transition into retirement easier and help seniors find a new path forward.” Samantha Westwood, Rise and Shine!